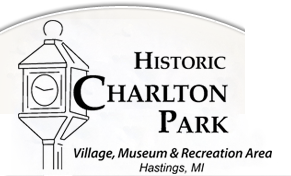 Description: The 10th Annual Charlton Park Day is Saturday May 28, 2016 from 11 am - 4 pm. Bring the whole family to Charlton Park Day. There will be free hot dogs, chips, drinks. Come on out and tour the buildings, maybe play some old fashioned games by the old school, meet some of the volunteers that will be in the buildings. Come on out for Charlton Park Day, Free Admission. This day is in honor of Irving Charlton the founder of Charlton Park. For more information call Charlton Park at 269 - 945 - 3775.